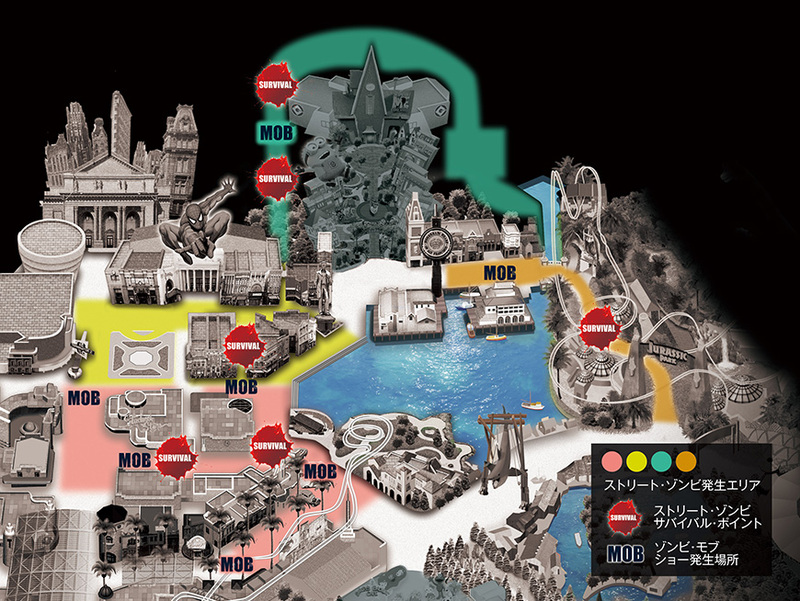 So it seems I only ever come back with information about Universal Studios Japan. I don't mind it so much though since it gives me an idea of what I should check out when I visit, but I do feeling a bit bad for leaving the blogging platform behind. But that is a conversation for another day. 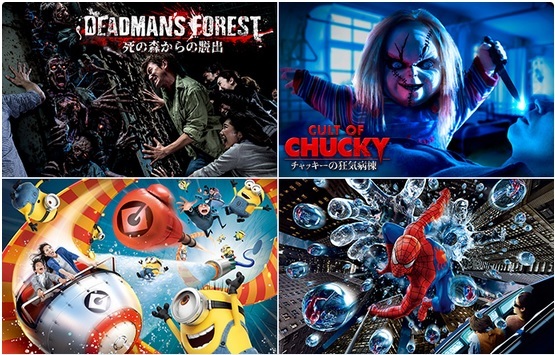 As some of you may have noticed, USJ is seriously trying to step up it's entertainment offering-game. With Nintendo World and Sailor Moon on the horizon, guest numbers are sure to sky rocket in the future, but surely they won't forget us loyal pass-holders that have been lining their pockets for years, SURELY. Today, we will just explore what USJ has to offer us for Halloween this year. 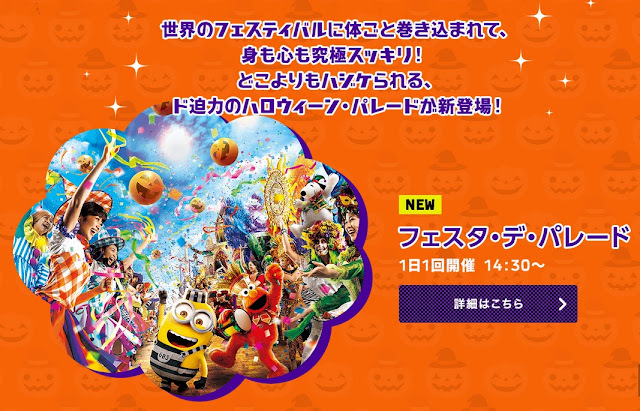 What is the Halloween Event in USJ? Essentially, this event is divided into two sections: a family-friendly version that's heavier on the dress up and party element of Halloween by the entrance, then the zombie apocalypse turned slasher film version that resides towards the back of the park. Your regular Shrek and Back Draft attraction are transformed into new horror-themed attractions, with the scare level on displayed for the frightened masses (some of the attractions are still in the Summer Jump form, but this should be over by the first week of October), and the afternoon parade becomes Day of the Dead/Halloween Snoopy-themed. As with any other themed event, Express Passes are available for those who don't have to the time for a second or third trip to the park. First we'll talk about the parade and street events that will take place throughout the park. For the most part, these events are kid friendly. For the street zombie area, children must be elementary school age or older and accompanied by their parents. As I mentioned earlier, the newest event is the Festa de Parade, which Google tells me translates to Parade Party. It is, indeed, a parade featuring not only music and dancing, but also foam machines. You know, like those foam parties you've seen in Ibiza documentaries. I do enjoy how Japanese theme parks pick and choose the parts of overseas culture they want to use for their own events. The music gets to be grating (it's a original Universal tune), and seems to feature Spanish (perhaps to connect the Day of the Dead theme to everything else), but the crowd really gets into the dancing in the street bit. It's refreshing to see people almost cut loose in the streets, but I'm sure my written description does the event no justice。Just check out the YouTube video below. This next event appears to be a powered up version of an event from last year called 'Happy Trick or Treat'. The site describes it as 'being showered in a waterfall of candy'. Unfortunately, this event is geared towards elemetnary school children, so if you're an adult in costume, you might not be showered with a waterfall of candy. There is a lot of Halloween food available throughout the park, however it seems adults in costume with season passes are privy to a happy hour at Finnegan's Bar and Grill (near Spider-Man). The outdoor Halloween market food can be found near the lake towards the center of the park. And that is all of the family-friendly fun for Halloween at the park. 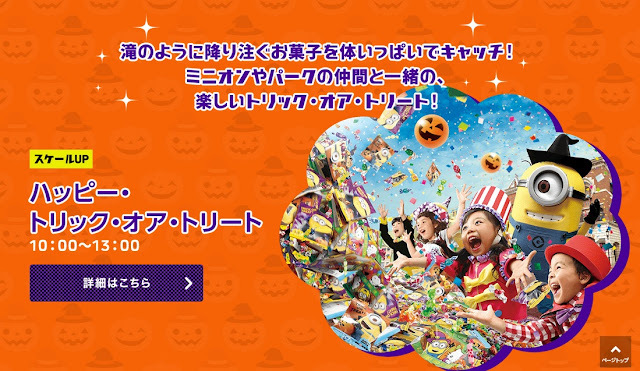 Of course, Wonderland is still open, and some stores will have Halloween decorations, but in terms of events tailored towards young children, this is about it. Everything else is a bit scarier, but luckily, there are scare-meters with age recommendations for the remaining Halloween attractions. First ,there is the 'Street Zombies' event, which also includes the Zombie Mob, but I prefer to call them the 'Zombie Flash Mob' (yes, they dance). They only appear in the park after 6PM (usually sunset around this time of year) and remain in the park until it closes. And according to the site, there are oer 20 varieties of zombies this year. As you have probably guessed, they dance to Thriller, but if it's the same version of Thriller as it was last year, it's a cover, and quite frankly, that's disappointing ONLY BECAUSE the real version of thriller is played throughout the park over the speakers. WAT. 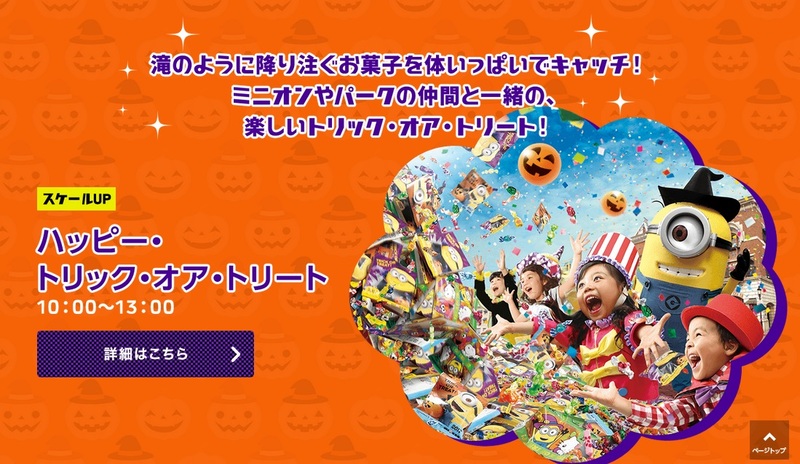 The Horror Level for this event is 1, which means infants/small children aren't allowed, but elemtary school children accompanied by their parents can participate. According to the map above, the Street Zombies will appear in the pink, ywllow, green and orange areas of the map above. The Survival Points are fences in areas where you can be surrounded by zombies, while the MOB marker is where you can find the dancing zombies. Please check out the website for examples of the types of zombies making appearances in the Street Zombies (you can also pay to get zombie makeup done). Survive this journey through hell! Hungry zombies appear in this new area. The next attraction is one I actually had a chance to visit on my most recent trip to USJ (commentary can be found in the video below). Deadman's Forest is attraction currently working out of the Back Draft attraction. You start off in the firehouse/garage, then you're lead to the makeshift "forest" behind the building. From there, you have to choose one of the many paths through the forest to get to the decontamination room at the end. once there, you have to use the passcode mentioned at the beginning of the attraction to escape. This event runs all day and has a Horror Level of 4. It's described as a outdoor horror maze and is recommended for ages 12 years old and older. You can use the express pass for this event, and child switching (taking turns to watch your kids I guess) is available. I recommend going at night. Set in a hospital where pitiful souls must relive their cruel fate. Anyway, this attraction is an indoor haunted house located in one of the empty studio buildings near the entrance. It's hospital themed, so if you're not much one for blood, gore (and feces), then I would recommend that you stay away from this one. It's not all that scary since you're walking through the attraction in groups of 6 or more, but the atmosphere is quite horrific. 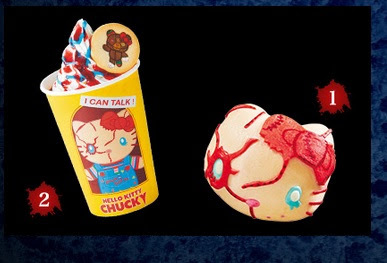 Something you never knew you needed, Chucky Hello Kitty Version. The Horror Level for this attraction is 5, which is half of the meters total value. 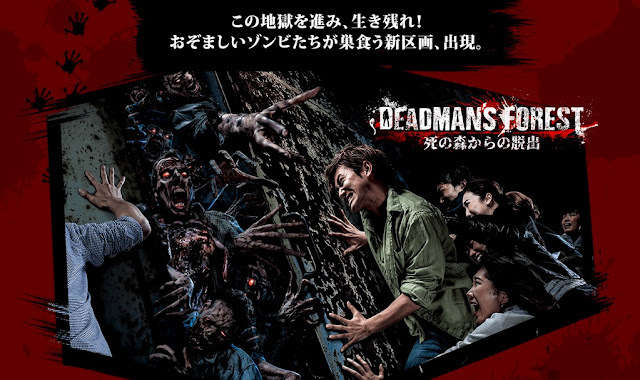 While it is definitely more horrific than Deadman's Forest, it's nothing to seasoned veterens of the jump scare.Express Passes for this event are available for purchase. 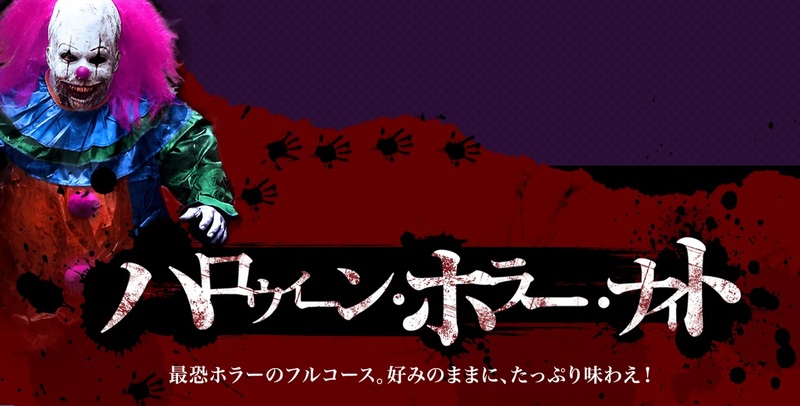 Try to escape from the unpredictable murdering psychopath. Next up is another horror movie classic, Freddy Krueger from the franchise that gave me nightmares as a child, A Nightmare on Elm Street. Unfortunately, I was unable to visit this attraction (I believe the timed-entry tickets were all gone) during my visit, but I'm hoping to get the chance next time. According to the website, it is an indoor horror maze, the opposite of our Deadman's Forest. You must enter a mansion and escape from the nightmare of a young girl trapped in a continuous sleep (?? I guess she can't wake up for some reason, not sure). It sounds like a escape room type of attraction, but perhaps without any puzzles and just a final passcode that you need to escape (much like Deadman's Forest). 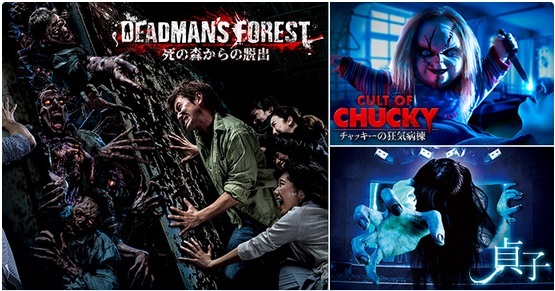 The Horror Level for this attraction is also 5, the same level as the Chucky attraction, so it will probably be a collection of jump scares and grotesque visuals. A nice bit of fun for friends in costume, but I'm not sure if it's worth running into the park to grab a timed-entry ticket, which is the only way to join the event, and which likely means that most park-goers won't get to try this attraction out. Express Passes are available for purchase. Here we have another indoor horror maze, this time based off of the film The Exorcist (one of my favorite horror films). USJ describes the attraction as "a walk through the home of a young girl possessed by a demon where you watch a heroic Exocists as perform a ceremony. Complete your mission and save this girl from a demon." The Horror Level, much like our other attractions, is 5. I think you can see the pattern they've deveolped for these Halloween attractions right? They're all a varient of the same maze/horror house concept, just based on different horror IPs. Sadly, the most interesting of the IPs, including this one, are the ones you need timed-entry tickets to see. Express Passes are available to those with the cash flow. Shriek in eternal horror; the ban has been lifted on this new maze sure to rip your very soul out. The last attraction for the Hallowen Horror Night event is Trauma. As far as I know, this is not based off of a pre-existing, but it has come to take place of the Resident Evil attraction required the purchase of a separate ticket (yes, this attraction is sold separately from your park entry). According to USJ. it is a journey through madness where you witness bizzare and horrific human experiments,and where you can be attacked anyway by a mysterious creature. The pictures for the attraction feature women strapped to chairs, which leaves me to believe that you may be strapped down to a chair at some point, but I'm not really sure. I also don't plan on spending the money to find out. The is the only attraction in the park that has a Horror Level of 10, which is the mazimum. Since there are no other attractions rated at 6 or higher, I can't really gauge how much scarier it is, but you have to sign a wavier before you join, so I'm guessing it gets pretty intense. This attraction costs 2,900 yen including tax, and is separate from park entry. This ticket can also be purchased in the Horror Night Express Pass 5 ~Trauma Set~ booklet, available for 7,300 yen including tax. These attractions make use of the 4D and Terminator theaters in the park. Both of these attractions start from 6PM. So if you've ever visited a Universal Studios before, you're probably familiar with the Temrinator theater attraction. It's a 3D-glasses light show, a precursor to the MX4D (as it's known in Japan) theater with moving seats. Instead this time around, instead of facing the Skynet and Terminators, you'll face Sadako from the RING franchise. According to the website, her curse starts to infect the theater and create a lot of strange phenomena. The Horror Level is 3, so I doubt it has much of the grotesque imagery used in the mazes, but even so, infants and small children are not permitted on these attractions. Express Passes are available but not needed to enjoy this attraction. The Sesame Street/Shrek theater has been turned into a presentation of a collection school ghost stories. I've not tried this attraction and have no idea what this colleciton of stories could be. Still, if you're interested in getting a bit more Japanese culture in your USJ experience, this would probably be a great attraction to check out, howeverm I doubt they will have English subtitles. Good luck! The Horror Level for this attraction is 3, same as the Sadako attration. I doubt it will be worth the 40+ minute wait you'll probably have to endure. You'd probably have more fun walking around the park, getting photos of other park attendees in costume. Express Passes are available, but not needed to enjoy this attraction. 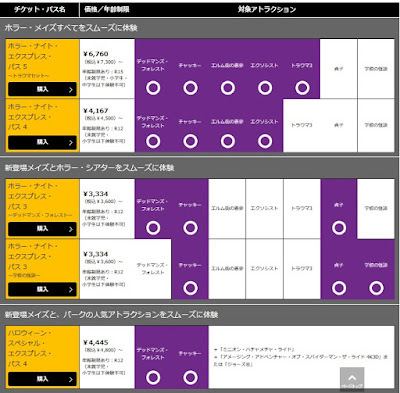 This a chart shows what attractions are listed under which passbooklet. As these halloween events are limited run, the lines for them tend to get pretty long. To help counter-act these long waits, USJ has timed-entry passes, and while these passes are free of charge, they usually run out as soon as the park opens. So unless you plan on being there right when the park opens, you may have a hard time getting your hands on these tickets. However, if you're certain that you really want ride these attractions, there's always the Express Pass booklet option. These are purchased separately from park entry, and are not cheap, but will guarantee you a spot on all of the attractions listed under the pass. The booklets will be listed from most expensive to cheapest, and all of them are available for purchase on the website and in the park. So as I probably mentioned above, I've already had my first visit to the Horror Night event. It was on the last Saturday of September, so still a bit early for some attractions, but it was nice to see so many guests already in costume (there was also a few Jump Summer cosplayers left over). I put together a short video of our thoughts and reactions to the end, plus I have footage of the entire Festa de Parade, so even if you can't visit in person, you can get a little USJ at home! Enjoy! 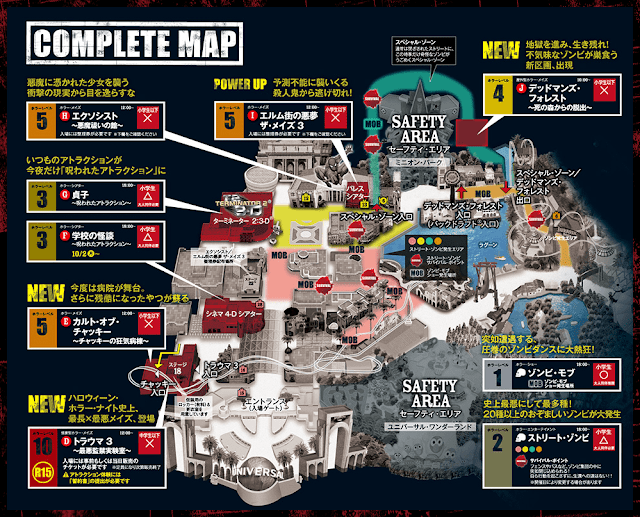 Here's a list of Japanese words and phrases that you might find useful during your visit to the Horror Night event. I was so scared! *kansai ver. 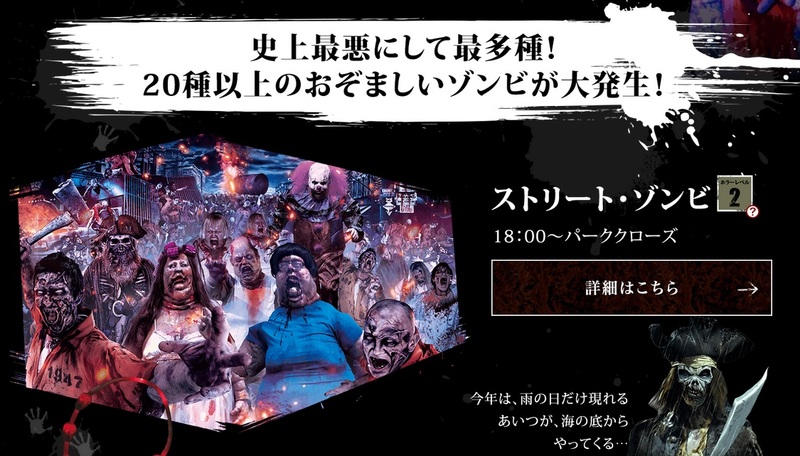 You can check out the official website for the Halloween Horror Night event, but it is all in Japanese. Thank you for reading if you made it this far! As always, questions, comments and concerns are welcome!